This study aimed at finding out whether or not there are any significant differences between the students who are taught by using neurological impress method and the students who are taught by using a conventional method in reading ability. The population of this study was 63 students of SMK Nurul Huda Sukaraja. From the population, there were 22 students taken as a sample of experimental class and 21 students were as control class. The sample was taken using purposive sampling. In carrying out the study, the writer used a quasi-experimental design. Finally, the data were analyzed by using the independent t-test formula. And based on the result of findings, it was found that the mean of posttest score in the experimental class was 6.83 and the control class was 5.08. Beside that, the t-obtained was 6.25 and the t-table with df 41 (43-2) with 0.05 significant level was 2.02. therefore, the study concludes that the alternative hypothesis (Ha) was accepted because the t-obtained was lowest than the t-table (6.25 > 2.02). It also meant that there were any significant differences between students who are taught by using Neurological Impress Method (NIM) and who are taught by using Conventional Method. Akib, Satika. (2005). Improving the Student’s Reading Comprehension Through Neurological Impress Method (NIM) to the First Grade of SMA Negeri 1 Palangga. Retrieved on Monday, January 15th, 2018. Anderson, R.C, Hiebert, E.H., Wilkinson, J.A.G., & Scott, J.(1985_. Becoming a nation of readers. Champaign, IL: National Academy of Education and Center for the Study of Reading. Arikunto, S. (2009). Prosedur Penelitian: Suatu Pendekatan Praktik. Jakarta: Rineka Cipta. Basrowi. (2008). Memahami Penelitian Kualitatif. Jakarta: Rineka Cipta. Brown, H.D. (2000). The principle of Language Learning and Teaching. The University of Illinois. New Jersey.NJ: Hall Regents. Burns, M.K.(2007). Reading at the instructional level with children identified as learning disabled: potential implications for response-to-intervention. School PsychologyQuarterly,22, 297-313. Cohen, L.(2005). Research Methods in Education. 5th Edition. London And New York: Routledge Falmer. Flood, J, Lapp.D., & Fisher, D.(2005). Neurological Impress Method plus. Journal Reading Psychology, Volume 26 (2) 147-160. Retrieved on Thursday, January 18th, 2018. Fraenkel, and Wallen. (1990). Education Research: A Guide to the process. United State: Mc Graw_Hill.Inc. Grabe, W. and Fredricka, L.S.(2011). Teaching and Researching Reading. Great Britain: Longman. Hatch, E,.& Farhady, H.(1982). Research design and Statistics for Applied Linguistics. Rowley: Newbury House Publisher. And knowledge Base Journal Reading Behavior vol.5 no.1.(Online). (from:hhtp/jlr.sagapul.com/content/10/1/49) Retrieved on December 25th, 2017. Heckelman, R.G. (1969). "Neurological Impress Remedial Reading Technique". Academic Therapy. Khalaji, H. R.(2012). The Impact of Reading Strategy Training on the Reading Comprehension of Iranian EFL Learners. Klingner, J. K. Sharon, V., and Alison, B.(2007). Teaching Reading Comprehension to Students with Learning Difficulties. New York: The Guilford Press. Nasrudin, A. 2012. The Effectiveness of Detailed Reading Strategy in Reading Comprehension for the Tenth Grade Students at SMA Negeri 3 Oku. Thesis. English Education Study Program Teacher Training and Education Faculty at Baturaja University. Pang, E.S., Muaka, A., Bernbardt, E. B. And Kamil, M.L. (2003). Teaching Reading. France: SADAG, Bellegarde. Pollard, L.(2008). Lucy Pollard's Guide to Teaching English: a book to help you through your first to years by teaching. London. Richard, C.J,.& Renandya, A.W.(2002). Methodology in Language Teaching. An Anthology of Current Practice. Cambridge University Press. Sudijono,A (2010). Pengantar Statistik Pendidikan. Jakarta: Raja Grapindo Persada. Sugiyono. (2010). Metode Penelitian Pendidikan, Pendekatan Kuantatif, Kualitatif dan R&D. Bandung: Alfabeta. Ziadat, Ayet H and Al- Awan, A.(2018). 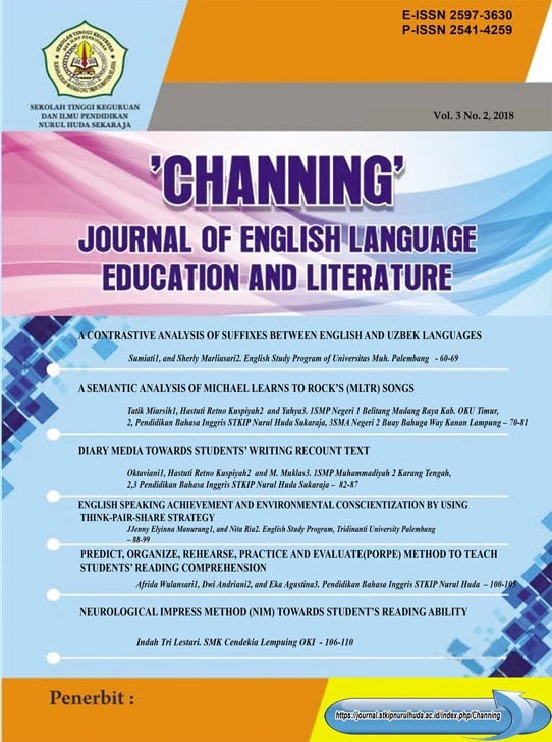 The Effectiveness of Neurological Impress Method on Reading Fluency of Students with Learning Disabilities in Amman, Jordan. (Online). (https://files.eric.ed.gov/fulltext/EJ1165244.pdf).